This bitter sweet triple chocolate fudge cake is the perfect finale to Sky High: Irresistible Triple-Layer Cakes for the cake slice bakers. Next month we begin baking from our new selection southern cakes. This cake is good. Deep dark chocolate cake layers with a hint of cinnamon filled with white chocolate mousse and topped with a chocolate sour cream frosting. I had problems with the mousse. It was not sturdy enough to support the weight of the cake layers and oozed out of the sides causing a lot of slipping around. To assemble this 3 layer cake I recommend freezing after each addition of the mousse or maybe some sort of stabilizer for a stiffer filling. I was ready to throw the whole thing away as an oozey mess of mousse seeped all over my table. But, I persevered. I propped the whole mess up, tried my best to center the layers and put it in my freezer before frosting. I don't think I will make this cake again. 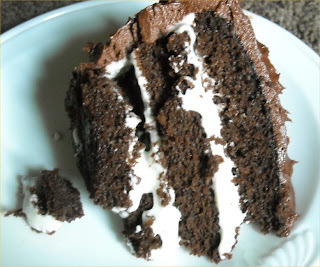 I have a go to chocolate cake recipe that I LOVE. In fact I love it so much I have blogged about it here and here! I have really enjoyed baking from Sky High: Irresistible Triple-Layer Cakes. The recipes have great flavor combination... there are so many more we never got to! My only caution should you bake from this book would be the frosting recipes. They seem to be closer to whipped creams or thin icings so if you want to pipe or decorate you will need to use a different recipe for frosting. Our next book to bake from is Southern Cakes: Sweet and Irresistible Recipes for Everyday Celebrations by Nancie McDermott. I have already book marked several recipes including Caramel Cake, Sweet Potato Pound Cake, Oatmeal Cake just to highlight a few. It should be a fun year for the Cake Slice Bakers with this new cookbook. Join us if you would like to bake along each month. 1. Heat oven to 350F. Butter bottom and sides of 3 (9-inch) cake pans. Line bottom of pans with parchment or wax paper and butter the paper. 2. For batter, sift together flour, cocoa powder, baking soda, baking powder, salt, and cinnamon. Set aside the dry ingredients. 3. Put chopped chocolate in heat-proof bowl. Bring milk to a simmer. Pour the hot coffee and milk over the chocolate. Let stand 1 minute, then whisk until smooth. Let the mocha liquid cool slightly. 4. In a mixer bowl, beat together the eggs, mayonnaise, and vanilla until well blended. Gradually beat in sugar. Add dry ingredients and coffee liquid alternately in 2 or 3 additions, beating until smooth. Divide batter among pans. 1. Place one cake layer flat-side up on cake stand. Cover top with half the white chocolate mousse, leaving 1/4 -inch margin around edge. Repeat with second layer. 2. Set third layer on top and pour half the sour cream chocolate over the filled cake. Spread all over the sides and top. Don’t worry if cake shows through. The first frosting is to seal in the crumbs which is whey professinal call it a "crumb coat". Refrigerate cake uncovered for at least 30 minutes to allow the icing to set. Cover the rest of the icing and set aside at room temperature. 3. Frost the top and sides of the cake with the remaining icing, which should have the consistency of mayonnaise. If the icing becomes too soft, chill briefly. If icing becomes too stiff, microwave on high 2 or 3 seconds to soften, and then stir to mix well. 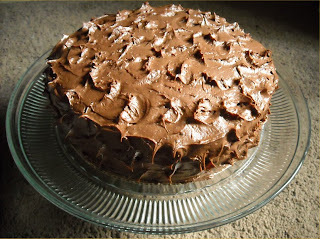 Use an offset palatte knife or the back of a spoon to swirl the frosting decoratively around the cake. For mousse, melt white chocolate with 1/4 cup cream in a double boiler or in a small metal bowl set over a pan of very hot water. Whisk until smooth. Remove from heat and cool to room temperature. When it has cooled, beat the remaining 3/4 cup heavy cream until soft peaks form. In another clean bowl, whip egg white with sugar until fairly stiff peaks form. Fold the beaten egg white into white chocolate cream. Then fold in the whipped cream just until blended (do not overwhip or your icing will split). Melt chocolate with butter and corn syrup in a double boiler over barely simmering water or in a heavy pan over very low heat. Remove from heat and whisk until smooth. Whisk in half-and-half and sour cream. Use while soft. 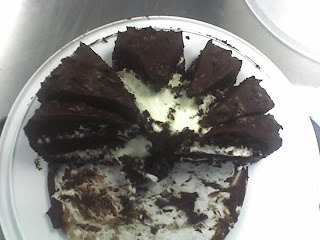 Edit: Here is the cake after I brought it to work and it sat out for a bit! I presliced it so the mousse would not ooze out. Oh well, on to the next baking adventure! you were able to pull off a really cute decorating job though! btw, i know the domingo cake too, and it's a great one! I'm glad you pulled it together despite the loose mousse- ha! It was a little soft and my layers were sliding around a bit so I had to stablize it with a skewer (or two) down the center. Great job on your cake and I can't wait to get baking from the new book! Great job! Your cake turned out beautifully- the mousse looks beautiful in between the layers of your cake! Great job on your challenge and I too had mousse problems (turned out too runny). But I love the cake in any case. Too bad about the filling as it sounds wonderful. About the mousse, i freeze entire cake, then cover with chocolate and put in the fridge before serving.. I lucked out with finding my trailer this spring from another fellow blogger(Viola Volte). I prefer the slant load trailers..they are bigger for the horse and though this one is not as big as my sisters-7 ft tall 6 ft wide- it is nice. "Thuro Bilt" And Moragan built trailers are great. Feather Lites are nice too. Mine has a removable wall to tack room to make it boigger as a stock trailer. I DO NOT prefer this...lets dust over to tackroom and shavings/ urine, as well under the wall. I have used clear chalk to fix that under wall stuff and plan on not removing the wall anytime soon. My sister had an electricaiom put a back up battery inside the tackroom...that can charge up as the truck is running, for the outside rear flood light,inside tackroom,outside tackroom and inside trailer stall. Nice addition I plan on adding sometime. There is a battery that does not corrode-that is the one to use as the other will ruin your tack eventually. take up matts- check floorboards, electrical, get double walls(don't dent as easily), padded dividers, one door to close(not two, hard when alone). If a two horse, make sure that divider may be secured OPEN, for one horse to have more room. My freind at Equine Mine got a trailer that you MUST close the divider as the back door won't close. Mine has an arm that slides to a smaller version and I can secure it, so it won't move on me if I am alone , for safe exit with my mare. Ask me something specific and I will answer, best I can. Your creations and photography is yummy!!!! Your cake is outstanding! I love freshly made cake. And sour cream mixed with chocolate in recipes. You made my day.